The Wakeful Stakes (2000m) is a Group 2 event hosted at Flemington Racecourse on Derby Day as a lead-up to the VRC Oaks. The Wakeful Stakes is a Group 2 race for three-year-old fillies contested at Flemington Racecourse. 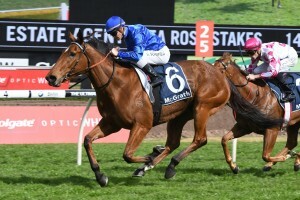 Held the Saturday before the illustrious Melbourne Cup in late October or early November annually, the Wakeful Stakes is one of 10 Group status races that fill the card on Victoria Derby Day. VRC Derby Day is one of the only race meets in Australia where every race has Group status. There are four Group 1 races on the card: the Victoria Derby (2500m), Kennedy Mile (1600m), Coolmore Stud Stakes (1200m) and Myer Classic (1600m). The Wakeful Stakes is a 2000m event for three-year-old fillies run under set weight conditions plus penalties. Worth $300,000 in total prize money it is an excellent lead-up race to the highly prestigious $1 million VRC Oaks (2500m) for three-year-old fillies the following Thursday. The Wakeful Stakes results have been a good indication for the Crown Oaks over the years, with 13 fillies taking out the double since 1983, including most recently Kirramosa (2013). Victoria Derby Day on Saturday November 3, 2018 featured the 2018 Wakeful Stakes. The top Wakeful Stakes 2018 odds and market links to the betting markets at Ladbrokes.com.au on the VRC Oaks lead-up race will be provided below the week of the race. The Wakeful Stakes field attracts a host of three-year-old fillies looking to back-up the next Thursday into the Crown Oaks field. Fillies competing in the Wakeful Stakes field may come via a number of earlier carnival races including the Group 2 Moonee Valley Vase (2040m) on Cox Plate Day the week before, the Group 2 Edward Manifold Stakes (1600m) or the prestigious Group 1 Thousand Guineas (1600m). The official Wakeful Stakes 2018 Field & Barriers are announced by Racing Victoria on the Wednesday before the race and will be provided in full below. The Wakeful Stakes nominations tend to attract some very decent three year old fillies. As a 2000m event, the fillies who enter the Wakeful Stakes nominations usually have an eye on later staying events, especially the Crown Oaks. The 2018 Wakeful Stakes nominations are released by Racing Victoria on the Monday leading-up to Victoria Derby Day and will be published below as soon as announced. The Wakeful Stakes was first run in 1932 when Protea won the inaugural race. It started as a principal event run over ten furlongs and remained the same until 1973 when the distance was converted into 2000m with Australia’s adoption of the metric system. In 1979 the Wakeful Stakes was elevated to Group 2 status. Many fine fillies have contested the race and high quality Wakeful Stakes winners include Zarita (2007) and Tuesday Joy (2006). Wakeful Stakes results, winners and placegetters since 2000 are listed below.